Cakes & More: Eggless Chocolate Cake - A Successful First!! I must say, I am not particularly interested or overly enthusiastic about eggless cakes. Reason being a common one, I have had many a disaster attempting these. And I take sometime to recover from these disasters before bouncing back and trying out a new suspicious eggless recipe again. I hope and pray I succeed at least this time, every time. But why bother trying out these recipes at all? Sometimes, I may want to bake or eat this cake on a 'no-eggs day' as on a festival day. Or bake for someone a cake on their 'no-eggs day'. This time, my motivation for hunting yet another egg less cake recipe was totally different. My daughter will turn 3 shortly and her school allows only egg-less cakes. Now, can I imagine not baking a cake for her on her special day? And nope, I am not going to order one from the bakery, no way!! :-)) I came across this recipe in Mallika's blog. She has great recipes, lots of divine cookies and bakes, and fantabulous pics on her blog. Do visit VegBowl if you haven't yet. The cake looked very delicious. The recipe simple and easy. No butter, no vinegar - good! No egg re placer... fantastic! I normally don't stock on these. Nothing I would have to plan way ahead or buy stuff specifically for this recipe. Well, that surely sounded good. So I baked this cake which became my first successful egg-less cake ever. Thanks Mallika for this delicious recipe!! The best thing about trying out a recipe from another blogger is you just have to copy and paste the recipe:-)). So here comes. You can also check out this recipe from here. Procedure: Pre-heat the oven to 180 degrees C. Grease and flour a baking tin. Warm the milk. Add the milk powder to it and stir well till it dissolves completely. I added a table spoon of instant coffee powder here. Use soy milk powder to make it vegan. Add in the oil and vanilla essence and whisk well. In another bowl, mix the flour, the baking powder, soda and salt along with cocoa powder. Combine well. Add the wet mixture to the dry ingredients and fold them. I added more milk to adjust the consistency of the batter. Transfer the cake batter to the baking tin. ( I used one small tin and a muffin tray. I had never used a muffin tray before for baking cakes directly) Bake for about 40 minutes or till toothpick comes out clean. Isn't this so easy and quick? We loved eating this cake, it was so chocolaty and yumm... Perfect as is or with a scoop of vanilla ice cream. I made a coffee sauce to go with the cake, but it tasted too sweet . Will surely make this cake again with chocolate ganache or coffee sauce, may be with a little less sugar perhaps in the cake next time.. This cake is also my entry to Divya's Best Chocolate Cake Event. Cake looks amazingly good. You are right on sweetness. May need to reduce on sugar esp if a sauce is topped over it. Very well presented Suma. I'm glad u liked it. Thanks so much for the recipe Mallika!! You should try working with flax seeds to replace eggs, specially in dark cakes...you will just not notice the egg is missing, trust me on this one! 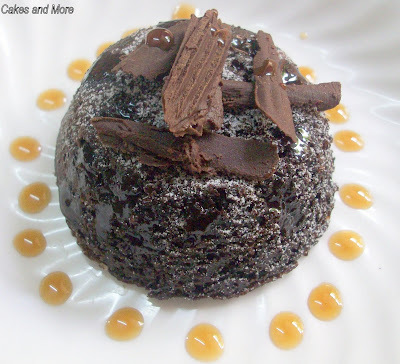 lovely chocolate cake recipe suma..I am going to try this soon, ofcourse by making it vegan..
@Gulmohar- Do try this out! @Deepthi- This was quite dense, but delicious. @ Madhuri - Will surely try out your 2 min choc cake!! @Priya- Do try out your vegan version and tell me how you liked it! Looks so tempting!! that too with out egg..I really appreciate it! Nothing less than 'Sinfully decadent' can describe this. I want, I want! I love it when eggless cakes come out well..:).I have tried a few recipes with success..This one's a first-no milkmiad,no vinegar..got to try! !Lovely presentation too!! Is soda bicarb and baking soda the same? Thanks for the recipe which I've just tried out. You can check out my blog if you like to see my result. hey...3/4th cup of cocoa powder..? ?didnt it make the cake taste bitter...?? ?did u use sweetened one>?? Great recipe, Rithika(my 10yr old daughter) made it all by herself. Your instructions are simple and precise like a dot that even at 10yr old can bake! Please do consider a seperate list of recipes for kids. u have mentioned milk as 1/2 cup(60 ml). my understanding was 1/2 cup is 120 ml if v assume 1 cup as 240 ml. can u plz verify. i have some milk powder left which i would like 2 finish off. @Valli - 1/2 cup is 120 ml you are right. the conversions in this recipe are not right and I haven't baked this since the time I put this post. I am extremely sorry about this, shall bake it again and update the correct recipe. Thanx 4r your quick response. let me try with 60ml( as it is always safe to start with less liquid). if the batter gets too thick i can slowly add 2-3 tblsp of milk to get the rt consistency.i'll give my feedback once i try out.in any case i shall also look out 4r your updates. btw... i enjoyed reading all your posts on the basics of baking & ingredients which are very useful.